Australia has long been a testing ground for new technologies and products just like contact-less technology found in credit cards & ePassports, the isolation of the continent in relation to North America & Europe probably contributes to the notion of a testing ground that can give real insights into the future global roll-out of products (plus they can contain any issues before they become global issues). An example of this (let me digress for a moment to prove the point), is the automotive industry here in Australia, we have more marks or manufactures in this country than in the USA or Europe. Just to name a few manufactures & given some of the marks have come and gone with this disparity of variety to population base (as of writing this post an estimated 23,547,811 people in Australia according to the Bureau of statistics) also proves that many global companies see Australia as a great & containable testing ground. Part of the reason for this is many Australians often fall into the category of ”early adopter” meaning they don’t mind giving it a go. This is especially is relevant in early technology up-takes. This is why Australia has been one of the first countries to fully embrace the contact-less payment systems that started fully rolling out in Australia in 2009 and partially before this date. Well before many countries. Even in these early adverts it show how easy it is to quickly use this facility to check-out, however it seems they may have reduced the read distance for the readers as now you have to actually hold the card a little longer than the footage shows. Perhaps because people were a little freaked out when their card was read from a greater distance unintendedly. In recent research undertaken by RFintelligence who are a global provider of business intelligence focusing exclusively on financial services, shows that Australians are leading the way with adopting this technology into their lives, which would be a great result for the card issuing companies & financial institutions. RFi’s latest payments research shows the take-up of contactless payments is gathering pace. By March 2014 two-thirds of Australian adults had a contactless card, up from 26 per cent in September 2011. And according to RFi, the activation rate, or the proportion of contactless card owners who have used their card to make a contactless payment, has increased, from 45 per cent to 72 per cent in the same period. One of the points I’d like to bring up is when you get issued a new card here in Australia you do not get the option to ‘op-out’ of a RFID enabled cards like visa’s PayWave & mastercards PayPass^ you just get sent them so I guess I can understand the increase in the stat’s & lets be honest the ‘tap & go’ facility is kind of convenient to use so I can also attest to the uptake of the use of the ‘contact-less’ check-out terminals as well. Hell we use them. What many of these people who have these cards in their wallet or purse do not know is that very same technology that is used in these cards & RFID check-out readers can also be used to wirelessly skim your cards & personal data. 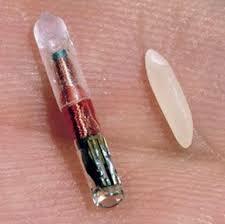 It is the nature of this technology, RFID transmits your data over open airwaves. The early origins of this RFID technology lay in the cold war and was originally used as a spy tool. Now, this technology is used everywhere from inventory tracking (yes a tracking tool) to embedded in your pets or into your clothes. 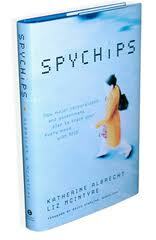 If you’re interested in how governments, companies & institutions want to you use this technology on you, then you should read this book called SPYCHIPS by Dr Katherine Albrecht who is the a global expert and champion of protecting your?privacy and exposing the truth & motives behind companies & governments wanting to implement this RFID technology. A truly interesting read. Now we are not saying the convenience of this technology is not great nor are we saying that the financial institutions & governments who have implemented this technology are not trying to better secure it, what we are saying is we personally were not satisfied with the level of protection offered by the passive protective devices on the market that claim to supposedly protect your data from being wirelessly skimmed. Armourcard ‘Actively’ powers up with its own battery (not relying on convection from the RFID reader) and emits a jamming forcefield that actually jams the most common frequency these contact-less devices communicate over of 13.56 MHz. We know there are a lot of different RFID protective devices on the market like RFID blocking wallets or shielding credit card sleeves that are passive, we developed Armourcard to personally protect our own data as we were concerned with the global roll-out of this technology and the limitations of passive protection offered in the marketplace. If you want to protect your personal information from wireless skimming then Armourcard with its Active jamming technology is the superior choice. ^Please note: Visa payWave, Mastercard PayPass & American Express ExpressPay are all registered trademarks of the afore mentioned relevant card issuing companies, These companies do not sponsor or officially endorse this website, Armourcard is independent & just protects these cards from being skimmed. *Passive Shields or metallic wallets Only reduce the signal strength, this will not block a high-powered RFID reader Source: Credit Card Fraud The contactless Generation | Kristin Paget | Chief Hacker, Recursion Ventures. Please note Kristin Paget does not sponsor or officially endorse this website or product, we have only referenced a report that is freely available online to download and read. All credit for the report and its findings go to Kristin Paget. 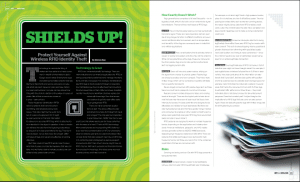 In the latest issue of the urban survival magazine called OFF GRID Magazine, they have written an article called “Shields Up” – Protect Yourself Against Wireless RFID Identity Theft. 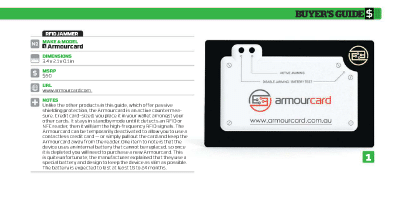 Armourcard is featured heavily within the article and is the only product on offer that offers a ’Active Countermeasure’, this has been picked up on and they were really impressed with our ‘ACTIVE’ technology versus all other products using ‘Passive’ shielding or blocking measures. There are a variety of products to help protect your privacy – most provide passive protection by trying to shield against transmissions while one, Armourcard actively jams them. It is fantastic for our product to be getting recognized offering superior active protection in a marketplace where all other products only offer passive protection. It seems we are not the only people out there who value their privacy & want to protect themselves from this growing global crime. 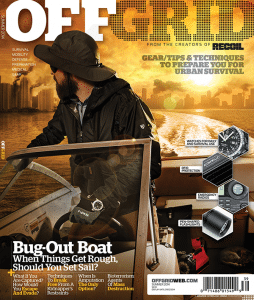 OFF GRID magazine is at the forefront with bringing solutions to issues that can & will affect our privacy we are very honoured that they see Armourcard as a great solution to wireless skimming. If you are serious about protecting yourself from being wirelessly skimmed then it is time to buy the only countermeasure on the market that actively jams out the frequency these RFID items communicate over. You can purchase a copy of the magazine at most good newsagents in the USA or you can Purchase Online Version. I want the superior protection that only Armourcard provides now. Buy now! Founder & CEO of Armourcard, Tyler Harris has been interviewed for a story on electronic pickpockets my the major news networks in USA. The article touches on the RFID technology used in many things from inventory tracking to credit cards, passports, ID cards & enhanced drivers licenses all vulnerable to being skimmed. RFID technology has been around since the cold war, originally a spy tool of the KGB. It lies dormant until powered by radio waves. The KGB originally planted these chips in embassies in West Berlin, which explains why when the embassy was searched for bugs, none were ever found. The device would lay dormant until a KGB operative, sitting outside in a van, pointed a reader at the wall in which the bug was hidden, usually when important meetings occurred. The article also cited A Wired Magazine article that showed how easy it is to be skimmed shown on stage at a recent DefCon hacker conference which is held every summer in Las Vegas. Harris smiled knowingly when told about the Defcon situation. That’s why we developed Armourcard. It is a similar shape to a credit card and fits in your wallet. It doesn’t try to block or shield the RFID reader trying to send a signal or communicate with your cards like other available devices. As soon as an RFID reader tries to interrogate your card or ePassport, Armourcard instantly powers up. It uses its own power source so it doesn’t rely on convection to power and it puts out a jamming force-field a jamming signal that blocks the frequency these readers communicate over which is 13.56 MHZ. 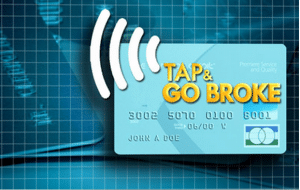 ‘TAP & GO’ Broke – A Current Affair Report just needs a follow-up story highlighting the wireless skimming vulnerabilities surrounding these cards. The renowned Australian news & current affairs program ‘A Current Affair’ has aired a report on some of the risks surrounding ‘Tap & Go’ credit cards & the technology that makes them work. We applaud Tracy and the ACA team for helping educate the public on the vulnerabilities surrounding these RFID enabled cards. However we believe that they may have missed a bigger opportunity to further explain how that a criminal does not even have to physically steal your credit card to use the ‘tap & go’ facility as these cards can easily be wirelessly skimmed by anyone with NFC enabled phone or someone who buys a RFID reader of ebay and search online for how to skim credit cards with it and download the free software to do it. We have followed up with the ACA team this morning in the hope that we can help with a follow-up story on the wireless skimming that can happen easily with these RFID enabled cards. Don’t become a victim of this crime, buy Armourcard now and get protected today.